There wasn’t a lot of fanfare when Apple Computer announced that it would commit $100 billion of the excess cash it had lying around to buying back its own shares. 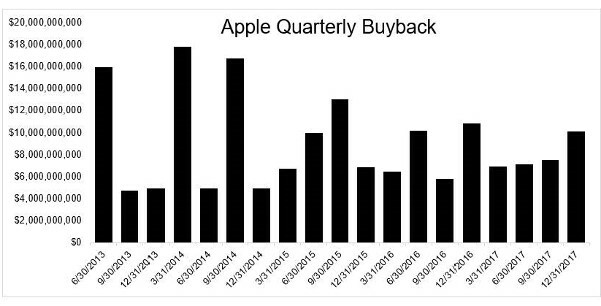 This may be because, as you can see from the chart, the company has made a quarterly habit of committing enormous sums to buying shares of what appears to be its favorite stock: Apple Computer. The company purchased $22.8 billion of its own stock in the first quarter under the previous buyback authorization—which, as it turns out, was a new quarterly record for a U.S. company, besting Apple’s previous high and giving the company the 10 biggest quarterly share buybacks in U.S. stock market history. To get a sense of the scale of these cash commitments, consider that Apple’s buyback in 2018’s first quarter was enough to buy every single share of any one of 275 companies in the S&P 500 index. If you add up the $210 billion that Apple has put into its buyback program since 2012, the sum is more than the total market value of all but 20 companies in the U.S. Add to that, Apple’s planned annual dividend bill—dollars returned directly to shareholders—will come to an additional $13.2 billion, making this, purely from a total cash standpoint, the highest dividend payment in the world. That single dividend sum alone is greater than the market capitalization of 141 S&P 500 companies. To the untrained ear, this looks like profligacy—careless shoveling of cash out of the company’s vaults, rather than reinvesting in new and better phone technology or a more efficient computer operating system. 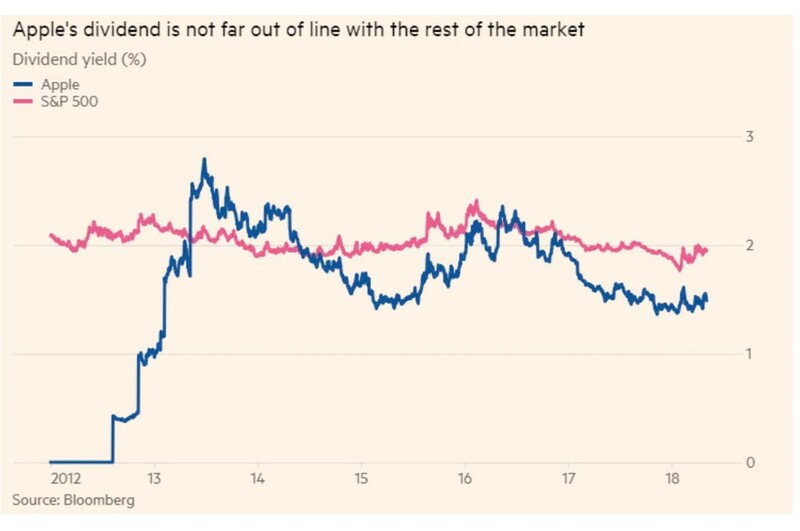 But if you look purely at the dividend as a percentage of share price, Apple is actually paying out less than the average S&P 500 company. 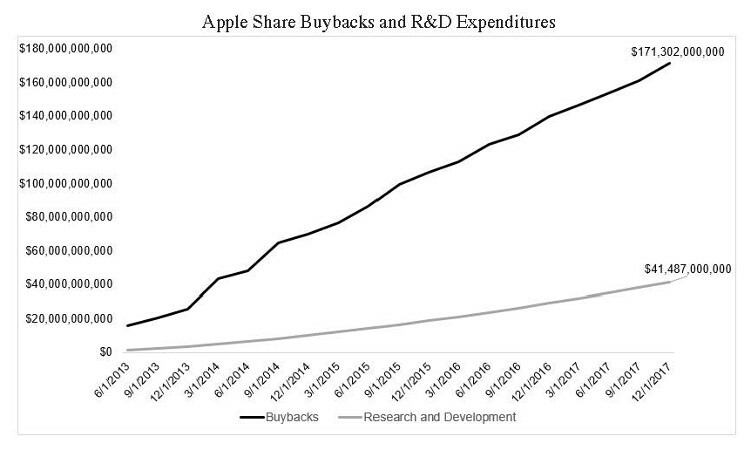 And despite the share buybacks and raised dividend, Apple has actually been spending more than $41 billion on research and development since 2013. The bottom line is that Apple could be purchasing companies like Qualcomm and Twitter—or controlling interest in ExxonMobil. But for now company management has decided that the excess money belongs in the hands of its shareholders.